Emmy Award winner Steve Harvey will host “2015 MISS UNIVERSE®,” it was announced today by The Miss Universe Organization and FOX. The three-hour annual event will air live from Planet Hollywood Resort & Casino in Las Vegas Sunday, Dec. 20 (7:00-10:00 PM ET live/PT tape-delayed) on FOX. 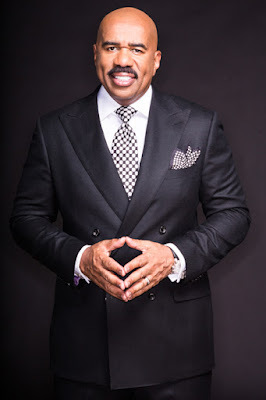 Steve Harvey is a TV personality, talk show host, actor and comedian who currently hosts two popular TV shows: “The Steve Harvey Show,” which premiered in 2011; and game show “Family Feud,” which he began hosting in 2010; as well as a nationally syndicated radio show, “The Steve Harvey Morning Show,” since its inception in 2000. Harvey began his career doing stand-up comedy in the mid-1980s. His success as a comedian eventually led to a long stint as host of “It's Showtime at the Apollo,” as well as various acting, hosting, writing and producing roles. Harvey’s television and film career includes roles in “Me and The Boys,” “The Steve Harvey Show,” “Steve Harvey's Big Time Challenge,” “Love Don't Cost a Thing,” “You Got Served,” “Johnson Family Vacation” and “Madea Goes to Jail.” In addition, Harvey is a best-selling author. The MISS UNIVERSE® telecast is one of the most-watched events in the world, with distribution in approximately 190 countries and territories. Contestants from more than 80 countries will vie to become the next Miss Universe in this special programming event, which will conclude with current Miss Universe Paulina Vega of Colombia crowning her successor. As previously announced, WME | IMG wholly acquired The Miss Universe Organization in September 2015. Prior to the acquisition, IMG had produced a number of shows for The Miss Universe Organization and will continue to do so with this year’s MISS UNIVERSE® telecast.